The classic white finisher. Flying and vigilance, all on a body big enough to rough up plenty of creatures on offense and defense. It should already be well-known how good Serra Angel is. While not one of the "Elite 8" (the eight cards that, as of M10, will have been in every core set), Serra Angel is one of the most famous and inflential cards in the game's history. Back before Standard and Vintage were different things, she gained fame as the only creature in Magic's first true control deck. In the long years since then, she's been a benchmark for the color white's philosopy; she's been considered both overpowered and limited fodder. She's been an uncommon and a rare and a bulk rare. She's seen it all, and her journey, much like ours, is far from over. Constructed: Poor Serra has not see much tournament play in a long time. Being a uncommon again will probably not help. Maybe she will rise to the top again. Casaul & Multiplayer: I think she has been around long enough that everyone except new players should have at least one copy of Serra Angel. She is a real good card for casual and multiplayer. Limited: Being at uncommon she will be alot more available for extra copies to pass around. Her stats as a card are very good for top pick. That did not sound right. Oh well. Overall a 4/4 flyer with Vigilance for 5 mana is still very good. Welcome back readers as we continue our reviews of Magic 2010. 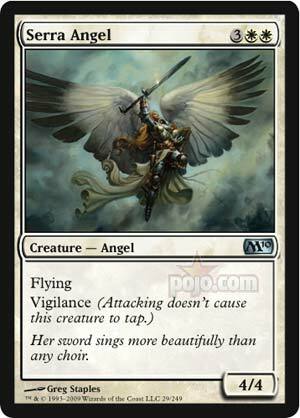 It’s been over 8 years since the Pojo staff has reviewed the infamous angel and with its recent reprinting in MTG 2010 at uncommon rarity, the time comes once again to see just why this angel warrants so much attention. For five mana two of it requiring white you get a 4/4 flyer with vigilance. Years have come and gone and seen the release of cards that pay homage to Serra Angel as well as cards that filed her role perfectly that is a big finisher able to manhandle opponents. Flying and vigilance on a 4/4 body make for a threatening finisher in control oriented decks that could use a solid win condition to unleash after slugging through its counterspells. In standard Serra Angel could be a boon to decks that utilize white creatures, possibly a Bant style deck as a finisher exalted and doublestrike from Rafiq and friends seems solid. As a constructed card Serra Angel certainly has aged well and is definitely a contender for any deck wanting a big finisher that flies. In casual and multiplayer it’s a flying angel with vigilance! This card can dominate the skies above kitchen tables. Having been on the receiving end of a Serra Angel it’s a must deal with threat that screams for removal, it allows a player to commit creatures to attack and let Serra hang back and block a large amount of creatures while still swinging in for 4. In limited its such a bomb, a flying creature with vigilance that has a big body and a fairly priced mana cost screams must pick if your in color or know an opponent that’s playing white. Overall age hasn’t diminished the impressiveness of this angel and once Magic 2010 hits expect players to take advantage of this flying dispenser of justice.